Senator John McCain, center, speaks about immigration reform legislation that would create a path for millions of unauthorized immigrants to apply for U.S. citizenship, April 18, 2013. WASHINGTON — The United States is widely known as the “Land of Immigrants” and the U.S. government intends to keep it that way. But major changes may be on the way in how the country deals with immigration. Eight U.S. senators from the Republican and Democratic parties have submitted a new bill to overhaul the immigration system, with a focus on immigrant work skills and improved border security. Such efforts have been made before, but this time there is a good chance the reform proposal will succeed. The proposed legislation is 844 pages long. You can read it here. Or, you can read this roundup of the highlights of the Border Security, Economic Opportunity, and Immigration Modernization Act. ​Under the new proposal, the cap on H-1B visas would nearly double from 65,000 to 110,000, and could rise to 180,000 if certain conditions are met. Gautam Aggarwal, a software engineer from India working for a Silicon Valley startup, poses with Indian god figures on his television set at his home in Mountain View, California. Spouses of people holding H-1B visas would be given the right to work and they would not count against the cap on H 1-B visas, if in turn, their country of origin allows the spouses of U.S. nationals working in that country to hold employment. Certain companies employing H-1B visa holders would be required to pay fees and higher wages to ensure they’re not using foreigners to keep down labor costs. A new W visa program would be created for low-skilled guest workers. In the first year after enactment, 20,000 W visas would be granted. That would rise incrementally to 75,000 W visas in 2019. W visa holders could not apply for a merit-based immigration status, such as permanent residency or citizenship. To protect American workers, no one with a W visa could be hired in a metropolitan area with an unemployment rate higher than 8.5 percent unless they have a special exemption from the Department of Homeland Security. Also, U.S. employers could not fire American workers 90 days before or after guest workers are hired. ​A new INVEST non-immigrant category would be created to encourage investors and startup companies to set up shop in the U.S. without having to depend on a U.S. employer. Arnulfo Ventura, co-founder of Coba, a Mexican beverage company, outside in his office and art gallery in downtown Los Angeles, Oct. 16, 2012. The bill would allocate 25,000 more visas to foreigners who have earned a master’s degree or higher in the field of science, technology, engineering or math (STEM). ​The bill would replace the H-2A visa program for agricultural workers with a new “blue card” for immigrants. Most of the one million farm workers in the U.S. are immigrants, up to a half are thought to be in the U.S. illegally. To get one of the 112,333 blue cards offered in the first five years, applicants would have to have held an agricultural job for at least 100 days in the two years before December 31, 2012, have no criminal history and pay a $400 fee and back taxes. Blue card holders would be able to apply for legal permanent residency in five years, faster than any other undocumented worker. A year and a half after the bill is enacted, the United States would no longer offer family-based visas to the siblings and adult married children of U.S. legal permanent residents and citizens. It would, however, grant an unlimited number of visas to the parents, children and spouses of legal permanent residents and citizens. The bill will allow immigrants illegally brought to the U.S. as children to apply for registered provisional status, and to adjust that status to legal permanent residency after five years, faster than other undocumented immigrants. These so-called DREAMers, named after the Development, Relief and Education for Alien Minors Act, can then apply for citizenship. Maria Rguez, of Mexico, learns math skills from volunteer teacher, Dharma Diaz-Azcuy, in a GED preparation class at Marist School, in Atlanta, Georgia, Oct. 11, 2012. They are eligible if they came to the U.S. before they were 16 years old, served in the military for four years, attended college for at least two years or earned a high school diploma or equivalent degree. Deported DREAMers also could apply to come back to the U.S. In 2015, the diversity lottery program would end, eliminating the 55,000 permanent resident visas allocated each year by a random lottery to people from countries not well represented in the U.S. In its place, 120,000 visas would be granted each year according to a merit-based system based on family relations, professional skills and work history in the U.S. The number would eventually grow to 250,000. The senators who drafted the immigration reform bill say they are not offering amnesty to the estimated 11 million undocumented immigrants in the U.S. There will be conditions and a long wait. 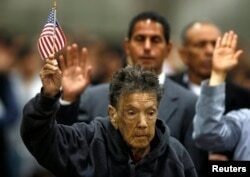 Mercedes Rosa Ruiz Mejia, 97, from Nicaragua takes the oath of citizenship in Los Angeles, California, April 16, 2013. ​Currently, legal permanent residents in the U.S. can become citizens after five years. For immigrants illegally residing in the U.S., the process would take much longer - 13 years. Once certain border security conditions are met, they would be able to begin the legalization process by applying for a new “registered provisional” status. Undocumented immigrants would be eligible for this if they entered the U.S. before December 31, 2011, hold a job, have not committed a felony or three misdemeanors, and pay back taxes and a $500 fine. Registered provisional immigrants, or RPIs, will not be eligible for public benefits, but they also won't be deported. If they already have been deported, they can apply to come back to the U.S. if they have a parent or child living here legally. RPIs must renew their status after six years, meeting the same criteria as before and paying another $500 fee. For another $1,000, they can apply for permanent residency 10 years after they initially were granted registered provisional status. In three more years, they can apply for citizenship. California Border Patrol agent Richard Gordon holds a carpet and wire wrap which illegal immigrants use to disguise their footprints after entering the U.S., March 25, 2013. Before undocumented immigrants can start on a path to legal residency, the U.S. border with Mexico must be 100 percent secure, and authorities must be intercepting 90 percent or more of people illegally crossing all high risk border sections, according to standards set by the reform bill. The Department of Homeland Security would get $6.5 billion to tighten security by increasing the number of border patrol officers, improving fencing and the use of drones and other means. Once those goals are met, the pathway to legal permanent residency can begin.